Straightened hair looks great, but if you regularly use hair straighteners, you’ll know that sometimes it just doesn’t turn out quite how you want, the more you use them the more damaged your folicles become. When your hair becomes damaged unforutnely styling your hair becomes difficult. If you need to straighten your hair on a daily basis, then its likely you have naturally curly or wavy hair. One of the issues with using straightener on natrual hair is that wavy hair is often caused by having dry hair and applying extra heat could exacerbate this. Fortunately, there are steps to take to ensure you can straighten your hair regularly and maintain the health of your hair. Follow our 6 tips below for straightening your hair. Don’t approach your hair in a random fashion by grabbing handfuls of hair, this will risk hair damage as you will find yourself reapplying heat to the same strands of hair over and over again. Instead section off areas of your hair so you can plan the order that you will straighten your hair. Use clips to clip up the top of your hair so you have easier access to the bottom layer of hair. Once you’ve straightened the bottom layer, unclip the top layer and straighten it as well. Sectioning off your hair may seem like an effort, but it can actually save you time as it stops you going over the same area multiple times. If you straighten your hair before it’s completely dry, you’ll probably hear a sizzling sound and your hair won’t even be straightened! Not only will you need to go over your hair multiple times, you’ll also be turning the moisture in your hair to steam which causes further damage. If you can feel any moisture in your hair, either wait for it to dry or gently blow dry it. Always keep your hair straightener clean and maintained. When you use a hair straightener, over time it will accumulate grease and grime which could rub off on your clean hair. Essentially, you’ll be making your hair dirty by straightening it and risk damaging it. Make sure the straightener is cool and not connected to a power source before wiping it down and removing any grease from the surface. Brush your hair thoroughly before straightening it. This will help to separate the strands of hair so you get the best results from straightening and aren’t heating an uneven clump of hair. If your hair is very curly, then you can even try brushing it between straightening different sections to help you achieve between results. Applying heat to your hair can put it at risk of becoming dry and damaged. If you wash your hair thoroughly with conditioner before straightening, you’ll add extra moisture to your hair and make it softer which makes it easier and safer to straighten. If you’re in a hurry you’ll probably be tempted to have your hair straightener on the highest heat setting to straighten it quickly. Do not do this! It’s one of the most common ways to damage your hair. When you get a new hair straightener, try out the different temperature settings, starting with the lowest. 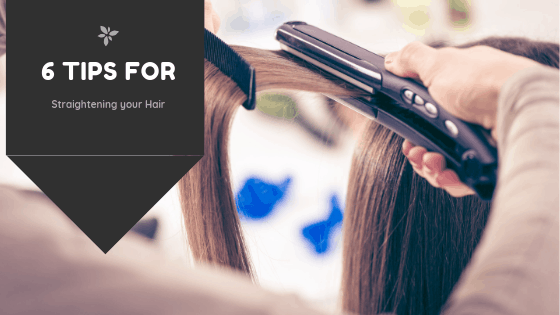 Once you find the lowest temperature setting that you can still successfully straighten your hair with, use this to help prevent you from overheating and damaging your hair. Hopefully by following the above steps you will be able to continue to use your straighteners on a daily basis but without causing damage to your natrual hair. How to Deal with Hair Loss, Physically and Psychologically?